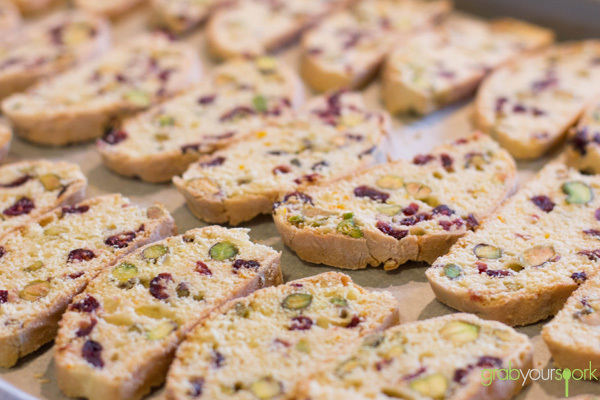 Where to start my ramblings on how much I love this cranberry and pistachio biscotti recipe? The first time I tried this biscotti was at Christmas time last year when Brooke made it and put it in little gift bags to give to the family. Thankfully, Brooke made two batches because I found myself eating piece after piece without realising just how many I had eaten. There are many variations available, but I’m reliably informed that this is a Donna Hay recipe. One of the things I like most about this cranberry and pistachio biscotti recipe is that it’s crisp, but not tooth-breaking like some other biscotti recipes. 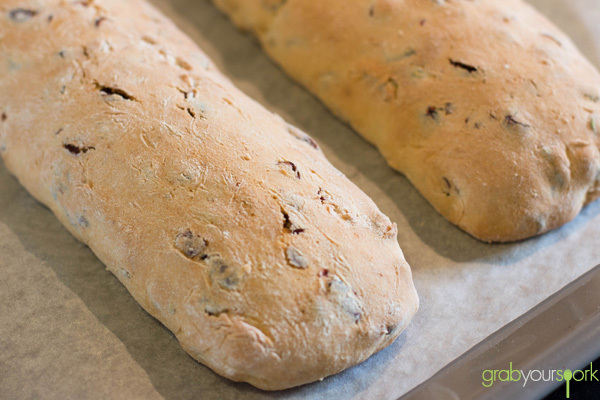 If you’ve never made biscotti before because you thought it is too complicated? Then you’re all wrong! It’s actually fairly straight-forward. The word biscotti (or biscotto) translates to “twice baked”, which is basically all you are doing. After baking the dough once in a log shape, then slicing the logs, you bake the biscotti again on a higher heat to dry them out giving them a nice crisp texture. The only tricky part is getting the timing of the second bake right so the biscotti are crisp enough. You don’t want chewy biscotti, but you don’t want to break a tooth either. Mind you the process is much easier when you are just observing it and taking photos like I was. Cranberry and pistachio biscotti make for a quick breakfast bite with your morning coffee, or if you’re like me a snack after lunch, or even a nibble before bed. I swear I have will power (no, I really don’t. None at all). But don’t let this deter you from making them. Just be sure to give at least half away to friends (or at the very least hide away from judging eyes while you scoff the lot). If your like our cranberry and pistachio biscotti recipe then try our melting moments with jam or ginger nut biscuits. The word biscotti (or biscotto) translates to “twice baked”, which is basically all you are doing. After baking the dough once in a log shape, then slicing the logs, you bake the biscotti again on a higher heat to dry them out giving them a nice crisp texture. 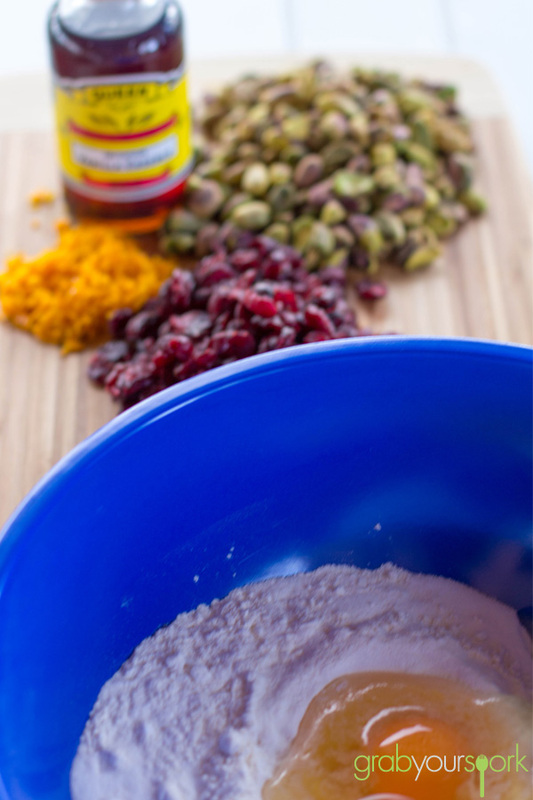 Place flour, baking powder and sugar into a bowl and mix to combine. 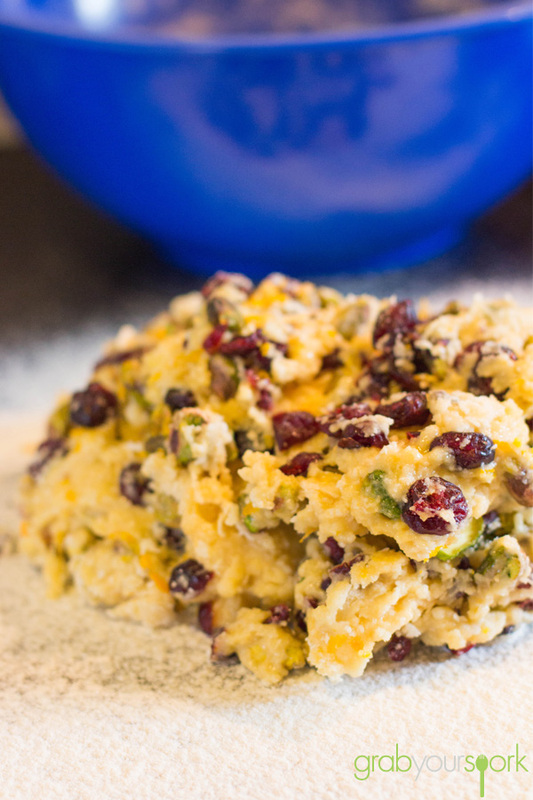 Add eggs, vanilla, orange rind, cranberries and pistachios and mix until you form a dough. Turn the dough out onto a table and with some flour, knead until smooth. Form into two logs and flatten slightly. Bake in oven on lined baking trays for 30-35 minutes or until firm. Allow to cool completely. Once cooled use a serrated knife to cut thin slices and place them back on baking trays. Reheat oven and increase temperature to 180°C. 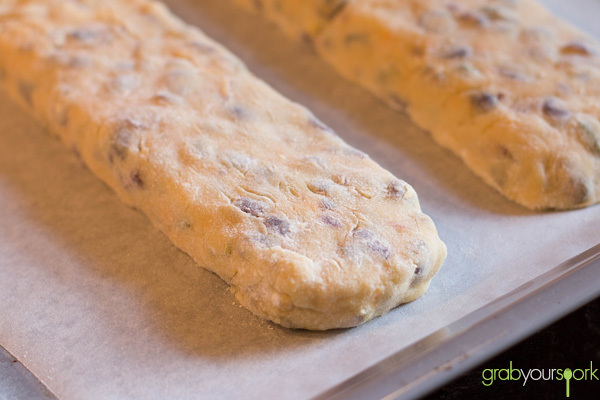 Bake biscotti for a further 8-10 minutes or until crisp. Cool on the tray for a few minutes before sampling. Just made this and it is great, thanks! Sending my preschoolers off to school tomorrow with Biscotti in their lunch boxes. Good stuff Samantha, fingers crossed the kids like the biscotti. Hi there! I’m very excited to try this recipe! I was wondering how long these would last in an airtight container. I’d like to ship them to my sister’s family across the country, but want to make sure they’d still be tasty after a few days. Thanks! This biscotti will last in a sealed container for a couple of weeks easily. Enjoy! Hi Kylie, Sorry for the over simple instructions. We have now updated the instructions. I hope your batch turned out ok? Great thanks for clarifying that. I can’t remember if I ended up increasing the heat or just cooking for a bit longer on 160C – whatever I did, they turned out fantastic! I’m just baking another batch now, this time using your guidelines on temps. I’ve actually been using your recipe as a base for other variations (coffee and almond) and they’ve worked out a treat. So thank you for posting an awesome, easy recipe! 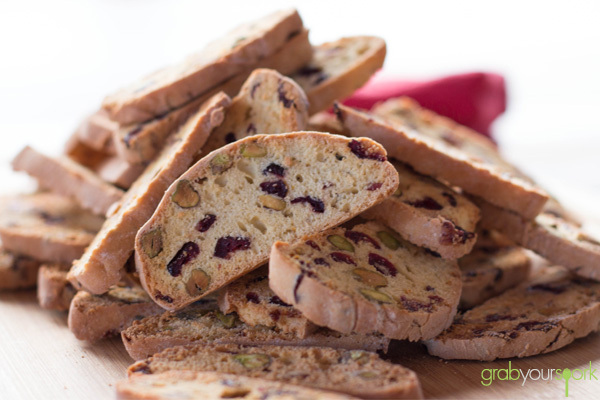 I love this Donna Hay Cranberry and Pistachio Biscotti Recipe too! 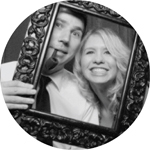 Your photos look great! Love this recipe, and very versatile to use as a guide for other flavours!